Kozani (Greek: Κοζάνη, pronounced [koˈzaɲi]) is a city in northern Greece, capital of Kozani peripheral unit and of West Macedonia periphery. It is located in the western part of Macedonia, in the northern part of the Aliakmonas river valley. The city lies 710 meters above sea level, 15 kilometers north-west of the artificial lake Polyfytos, 120 km south-west of Thessaloniki, between the mountains Pieria, Vermio, Vourinos and Askio. Its population is estimated at about 50,000. The climate of the area is continental with cold and dry winters, and hot summers. Kozani is the home of the Technological Educational Institute of Western Macedonia and the University of Western Macedonia, with about 15,000 students from all over Greece and other places. It is also the seat of West Macedonia's court of appeal, police department, fire brigade, the seat of the 1st Army Corps of the Hellenic Army and of the Bishop of Servia and Kozani. One of the most important aspects of local folklore is Kozani's carnival at the end of the winter, which retains much of the profanity of the ancient Dionysiac cult. Kozani is renowned in Greece and abroad for the production of Saffron (Krokos Kozanis), in the nearby town of Krokos. Kozani is a transport node between Central Macedonia, Thessaly and Epirus. The nearest airport is Filippos Airport, 4 km from the city, IATA code: KZI. The airport was first opened in the mid-20th century. Kozani is situated near the Egnatia Highway, which connects the coast of the Ionian Sea with Thessaloniki and Turkish borders. According to prevailing opinion in Greece, the name comes from the village of Epirus Kósdiani, the origin of settlers of Kozani in 1392. The settlement was first named Kózdiani, which then, it was changed into Kóziani, and in the end into Kozáni. Another opinion is that the name "Kozani", derive from the slavic kožani < koža 'skin, leather'. Antiquities from the prehistoric to the Byzantine period have been unearthed in many parts of the city. In the east part of Kozani, an ancient necropolis has been found, dating to the early Iron Age. During Philip II of Macedon's reign, the region was named Elimeia, which was part of Upper Macedonia. In the south-west of the modern city, on Siopoto hill, there was a settlement named Kalyvia, between 1100 and 1300, traces of which are still preserved. Kozani was probably founded by Christian settlers who, after the Ottoman conquest, withdrew from the plains of Macedonia into the mountains, during the 14th and 15th centuries. Its secure position soon attracted other Christians expelled from Epirus, in 1392. Together with the settlers from Epirus, many cattle-breeders moved in the region. The first recorded mention of Kozani is in an Ottoman register of 1528, as a settlement with 91 houses, 23 singles and 15 widows. 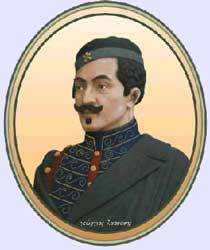 One of the most important colonizers of Kozani was the chief shepherd Ioannis Trantas, who settled about 100 families. His son, Charisios Trantas, managed to obtain a Sultan's firman in 1664, according to the terms of which the town came under the protection of the Sultan's mother, was endowed with many privileges, and became forbidden for the Turks to settle in. 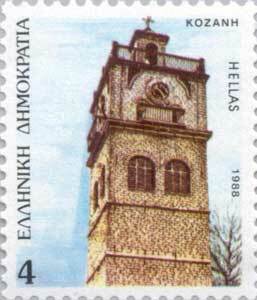 Agios Nikolaos' clock tower (Mamatsios), landmark of the city, in 1916. In 1664, the magnificent church of Agios Nikolaos was built. 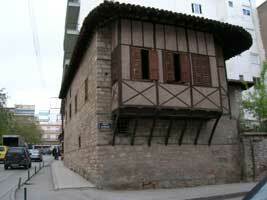 In 1668, the library and the famous school of Kozani were founded. During the 17th and 18th century, commercial relations with the countries of central Europe gave the opportunity for the city to flourish economically. During the 19th century, as foreign travellers relate, the population of the town was Greek, and was growing (Leake 1835:305 and Bouè 1854:87). The town's growth was disrupted in 1770, because of conflict that erupted between Kozani's local inhabitants and Kozanite merchants in central Europe, who contributed to the town's prosperity; even more catastrophically, the city was pillaged by Turkish beys in 1770. A subsequent incursion by Aslan bey, in 1830, ravaged the city immensely. 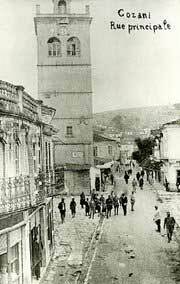 In 1855 next to St. Nicholas Church a 26 meters high bell tower was built, which would become the symbol of the city. In 1939 a clock will be placed on the top floor of the tower, donation of Greek American Konstantinos Mamatsios. According to the 1904 population census, 12,000 Greeks and 350 Vlachs were living in Kozani at the time. 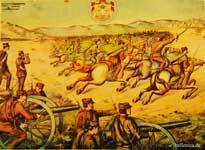 The Greek army entered Kozani on 11 October 1912, during the First Balkan War, after its victory against the Ottoman army in the Battle of Sarantaporo. By this time, the population of the town was 12,000 Orthodox Greeks. In 1923, during the population exchange between Greece and Turkey, about 1,400 Greek families from Pontus and Asia Minor were settled in Kozani. In the 20th century, the city grew tremendously, as lignite reserves in the area started being used by Public Power Corporation, making Kozani the foremost producer of electrical power in Greece. An earthquake that occurred in the region on 13 May 1995, with a magnitude of 6.6 on the Richter scale caused only property damage. The city now combines modern with old architecture. Some magnificent buildings are the Clock tower, the Townhall, the Folklore museum, the "Valtadoreio" Gymnasium, the National Bank building, the "Ermioneion" Hotel and the mansions of Georgios Lassanis and Grigorios Vourkas. 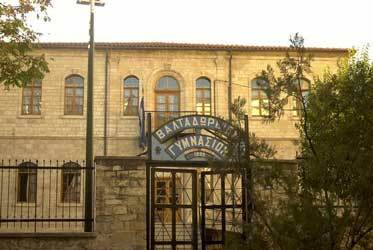 The Municipal library of Kozani called "Kovendareios" is the second biggest in Greece, and it has 150,000 books, rare publications, valuable documents, and one of the rare copies of Rigas Feraios Charter. For this reason Kozani was included in the National Cultural Network of Cities with object the promotion of the Book and Reading. The Institute of Book and Reading was established and Kozani is now known as City of Books. Today Kozani is the administrative, commercial, economic, and transport centre of the region of West Macedonia. The city is mostly known for its important contribution to the Greek electricity supply, and a large part of the population works in coal power plant (DEI - Greek national electrical company). In the region, 80% of the electric energy of the country is produced. Other famous products are marble, Saffron, (Krokos Kozanis), fruits, local wines and specialized arts and crafts industry. A lot of banks have branches in Kozani. The local bank is named Bank of West Macedonia. The Commercial Exhibition of Kozani takes part in the Exhibition Centre of West Macedonia in Koila Kozanis every September. Many firms from Greece and other Balkan countries participate, especially with local products. 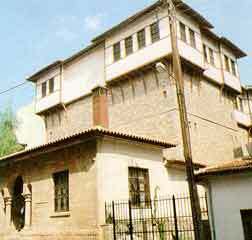 The Historical - Folklore and Natural History Museum of Kozani. The bridge over the Polyfytos artificial lake of the river Aliakmonas in Kozani Prefecture. The Historical - Folklore and Natural History Museum of Kozani is a place worth visiting. It is built according to old Macedonian architecture, and in its 6 floors, visitors can see everything about the geography, natural history, flora and animals of the region, as well as the history, the traditions and the past way of life in Kozani. The Kozani Museum of the Macedonian Struggle, a museum dedicated to the history of the Macedonian Struggle. The clock tower and the church of Agios Nikolaos - 350 years old - in Nikis Square. Other attractions include the Grigorios Vourkas Mansion and the Georgios Lassanis Mansion. The second one lies in a central square, named Lassani Square and it is used as the Municipal Map Library. The bridge above the lake of Polyfytos. 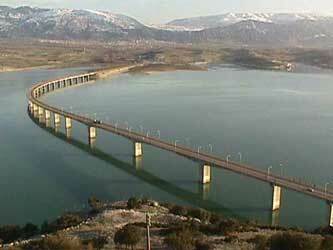 It is the longest bridge in Greece and measures 1372 meters in length. The mansion of Georgios Lassanis in Kozani. There are some telecommunications companies, TV and radio stations, newspapers, magazines, and web portals based in Kozani. The television channels are West Channel, TOP Channel and Flash TV. Top-circulation newspapers include Chronos, Grammi, Tharros and others. The bridge over Polyfytos lake near Kozani. Kozani is accessed with Motorway Egnatia (or GR-2, or E90) from Ioannina and Thessaloniki, GR-3 (or E65) from Larissa and Florina, GR-4 and GR-20. By bus, (KTEL Kozanis) for all West Macedonian towns and for the biggest Greek cities Athens (4 times/day - 470 km), Thessaloniki (every hour - 120 km), Larisa (120 km), Volos, Ioannina (160 km), Patras. By aeroplane (Sky Express), the city is connected with Athens and Kastoria from Filippos Airport which lies 3 km south-east of Kozani. By railway (OSE) to Thessaloniki (Railway Line Kozani - Amyntaio). The public transit in the city is provided by minibuses, and between the centre and the municipal departments, it is provided by Transit buses. The traffic problems of the city have become more severe during the last few years. The Kozani Zone of Alternate Urban planning (ZEP) and the building of the periphery of West Macedonia. 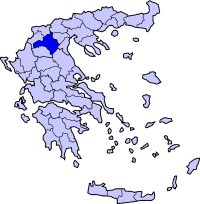 Map of Kozani center, Greece. The Municipality of Kozani within West Macedonia after the 2011 reform. 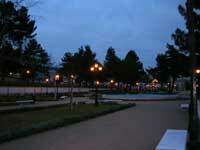 The new park of Kozani, near Municipal Stadium. The total population is 68,680. It is developing into a nodal town of the Western Balkans, with areas and activities of a wider regional nature. Within this context, the municipality of Kozani is creating a modern satellite town, the Kozani Zone of Alternate Urban Planning (ZEP). The Municipal Corporation of alternate planning and development of Kozani S.A.(DEPEPOK) was established in order to implement the projects of the ZEP. The ZEP is strategically located on 50 ha south-west of Kozani, and aims to become a model development centre, attracting an urban population and economic activities from throughout Western Macedonia in Greece and the Western Balkans. 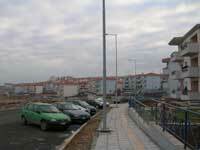 Other known neighborhoods of Kozani are Sk'rka, Ipirotika, Gitia, Agios Athanasios, Platania. There are 18 Primary schools in Kozani, and another 8, in the municipal departments of Vatero, Kariditsa, Koila, Lefkovrysi, Lefkopigi, Nea Charavgi, Xirolimni and Petrana. 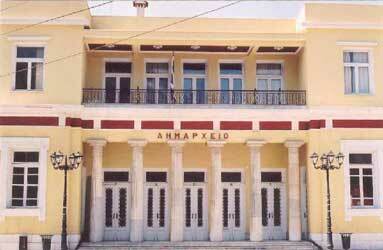 The Gymnasiums of the city are 8, and there are two more in the municipal departments of Lefkopigi and Xirolimni. There are also 4 Lyceums, 4 Technical Schools (TEE), some Business Schools and one municipal Odeum. Kozani is the home of the Technological Educational Institute of Western Macedonia - one of the biggest in Greece (founded on 1976). Three of its Faculties are in the city - the Faculty of Administration and Economy, Technological Applications and Health. (The rest of them are in other places of West Macedonia). The seat of the University of Western Macedonia and its Faculty of Engineering, they are also in Kozani. The University was founded in 2002. Fanos; an old carnival custom. The mansion of Georgios Lassanis in Kozani. Today it is used as a Municipal Map Library. 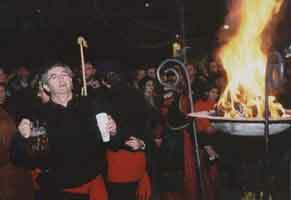 Kozani carnival is one of the most important events in the region, taking place the end of the winter. The most interesting local celebration during the carnival are the Fanoi (great bonfires), which are lit in the squares of Kozani. Around them, people sing and dance mainly scoptic songs and local dances, such as the best known song in the region - the Enteka of Kozani, often called Kozani's "national anthem". All celebrations become more exciting on the Sunday of the last week, after the carnival parade, when bonfires are lit all over the town which burn until the early morning hours. At the end of summer Lassaneia Events are organised. They consist of theatrical representations, concerts, athletic events etc. The name "Lassaneia" comes from Georgios Lassanis, who was from Kozani and participated in the Greek War of Independence. A part of those events is also the new authors song festival "Nikolas Asimos". Niaimeros is a fair in the north of the city in the Niaimeros place. It takes place on the first Tuesday of October. It used to last 9 days (niaimeros = nine days), but now it lasts only 3 days. Official local public holidays are the celebration for the liberation of the city from the Turks on 11th October and Saint Nicolas day - Kozani's patron - on 6th December. The municipal Band is named Pandora. It was founded in 1902, and it takes part in all the events and celebrations. A typical dish in Kozani is the so called Giaprakia. The main ingredients are meat and rice in salty carbage-leaf, having the shape of an egg. It is used often as Christmas food. Kichi (Kozanitiko kichi) is called another local dish, which is actually a cheese pie with circular-snail form. 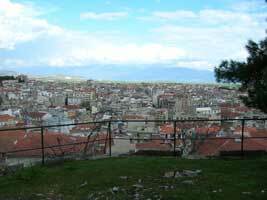 View of Kozani from the south. Ioannis Topalidis, (1962–present), former Greek football player, assistant manager of the Greek national football team. ^ Κώστας Δ. Ντίνας 2005. Το γλωσσικό ιδίωμα της Κοζάνης. ^ Μεγδάνης, Χ. 1820. Αγγελία παρί της αρχής προόδου της Ελληνικής Σχολης. Βιέννη. ^ Χατζηιωάννου Μ.-Χ. 2000:32. Η ιστορική εξέλιξη των οικισμών στην περιοχή του Αλιάκμωνα κατά την Τουρκοκρατία. Ο κώδικας αρ. 201 της Μονής Μεταμορφώσεως του Σωτήρος Ζάβορδας. Αθήνα: Κέντρο Νεοελληνικών Ερευνών/Εθνικού Ιδρύματος Ερευνών. ^ Γουναρόπουλος, Κ.Α. 1872:488-9. Κοζανιτικά. Αθήνα: Πανδώρα ΚΒ & Λιούφης, Π. 1924:44-5. 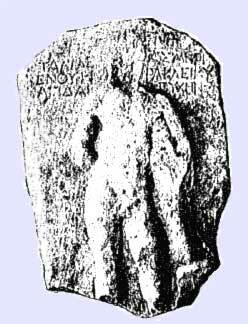 Ιστορία της Κοζάνης (History of Kozani). Αθήνα. ^ Leake, W.M. 1835:305. Travels in Northern Greece. London. ^ Bouè, A. 1854:87. Recueil d' itineraires dans la Turquie d' Europe. Details topographiques et statistiques sur cet empire. Vienna. ^ Κωνσταντίνος Σπανός. "Η απογραφή του Σαντζακίου των Σερβίων", in: "Ελιμειακά", 48-49, 2001. ^ A. Chalkiopoulos (Χαλκιόπουλος, Α.) 1910:109. Εθνολογική στατιστική των Βιλαετίων Θεσσαλονίκης και Μοναστηρίου. Athens. & Χατζηιωάννου Μ.-Χ. 2000:37. Η ιστορική εξέλιξη των οικισμών στην περιοχή του Αλιάκμωνα κατά την Τουρκοκρατία. ^ "Απεβίωσε ο πρώην υπουργός Μιχάλης Παπακωνσταντίνου". In.gr. 2010-01-17. Retrieved 2010-01-22.